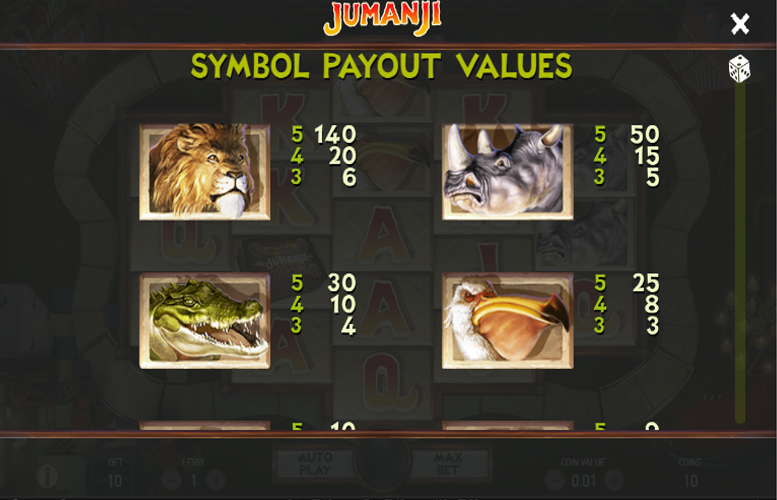 The Jumanji slot machine from Netent is a homage to one of the great modern classic movies of our time. It features artwork that is true to the original content, as well as a whole host of special features that make you really feel like you’re playing the all-too-real action/adventure board game yourself! Let’s look closer already. Amazing selection of gameplay features. This keeps the action constantly varied. Great artwork and music create a game with a strong feel. It’s hard to find anything to dislike about this game. Maybe the prizes are a little low but thanks to the extensive features, you hit them a lot! Lion = 140x the line bet. Rhino = 50x the line bet. Crocodile = 30x the line bet. Pelican = 25x the line bet. When a player activates the Sticky Vines feature, re-spins are awarded which increase the total win. During this game feature, all symbols that are part of a win and all “Wilds” from the initial spin (even those that are not part of a win) will stick to the reels. All other symbols will spin again. If the Monsoon “Wilds” feature is randomly activated during the main game, one or two reels will be completely covered in “Wilds” while the reels spin. 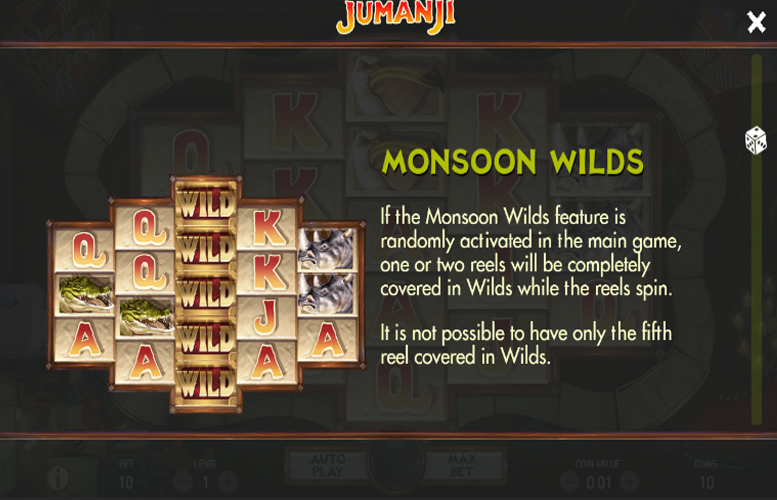 Players should note that it is not possible to have only the fifth reel covered in “Wilds”. If the Monkey Mayhem feature is randomly activated in the main game, any potential wins are awarded once the reels have stopped. Then, all symbols are shuffled randomly to create a guaranteed win, which is then evaluated and awarded according to the pay table. 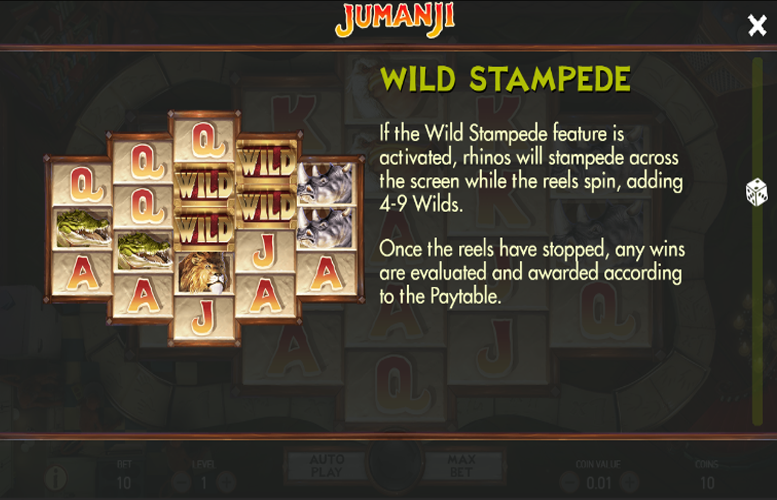 If the Wild Stampede feature is activated, rhinos will stampede across the screen whilst the reels spin. This will cause between four and nine “wild” symbols to be added to the grid. Once the reels have stopped, any wins are evaluated and awarded in accordance with the pay table. 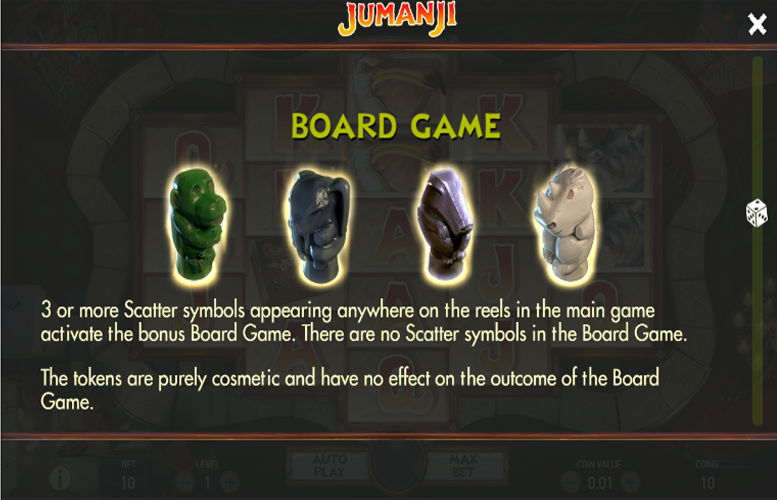 Landing three or more “Scatter” symbols anywhere on the reels during the main game will activate the bonus Board Game feature. There are no “Scatter” symbols in the Board Game. The different tokens are to keep the action consistent with the original movie and have no effect on the outcome of the Board Game itself. The player will move around the board by rolling two six-sided dice. The odds for dice rolls are as they would be in real life. Three “Scatter” symbols = six dice rolls. Four “Scatter” symbols = seven dice rolls. Five “Scatter” symbols = eight dice rolls. Each Free Spin feature is located at each corner of the board game. When the token lands on one of the two locations in front of a feature, that feature will be activated. When the Vines Free Spins feature is activated, 10 free spins are awarded. In this game feature, re-spins will always be activated if a win is present after the initial spin. One Free Spin can have multiple re-spins, which work the same way as during the Sticky Vines feature. The Vines will grab hold of the “Wilds” and keep them held for the duration of the feature. It doesn’t matter if they formed a winning combination or not! When the Monsoon Free Spins feature is activated, seven Free Spins are awarded. The same rules will apply in the Monsoon Free Spins as in the Monsoon Wilds mode detailed above, with the exception that the same covered reels cannot be chosen for two consecutive Free Spins. When the Monkey Free Spins feature is activated, six free spins are awarded. During these, each free spin contains the same shuffle mechanics as in the Monkey Mayhem feature. When the Stampede Free Spins feature is activated, five free spins are awarded. During this mode, each free spin contains the same mechanics as it does in the Wild Stampede feature. When the game piece lands on the Mystery Feature location, the Mystery Feature is awarded. 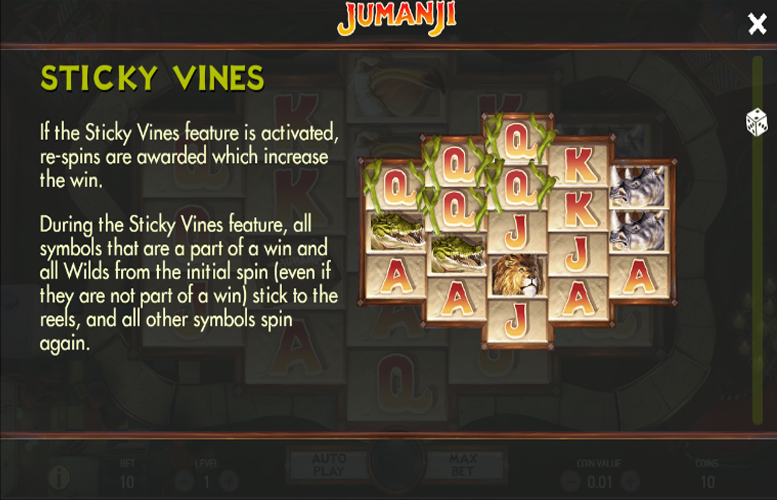 This causes a carousel of Free Spin Features, coin wins, and two extra dice rolls to appear within the Jumanji game board circle. The player is awarded with the one that the carousel stops on. Players should note that since each Free Spin Feature can only be activated once within a Board Game session, those previously won will not be part of the Mystery Feature carousel. In addition to all the above, players can be awarded with extra rolls of the dice, as well as instant coin wins during the Board Game mode. Ace = 10x the line bet. King = 9x the line bet. Queen = 8x the line bet. Jack = 7x the line bet. Players can adjust the number of coins bet per line as well as the value of each one. The highest and lowest values respectively are £2 and 1p. Meanwhile, between one and ten coins can be bet on each of the ten supposed win lines. This means that with all the values maxed out, the largest possible bet per spin is £200. With them all set to their minimum, the lowest possible wager on each spin is just 10p. 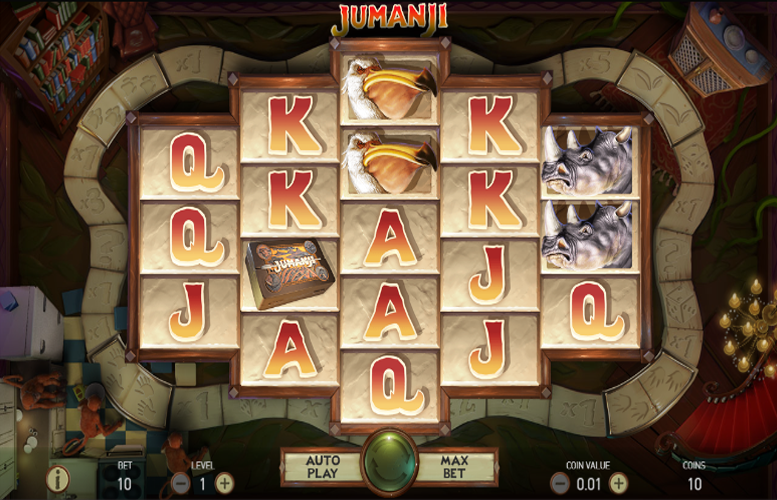 All told, the Jumanji slot is a pretty special offering from one of the online gambling industry’s best developers. We really struggled to find anything to dislike amongst the eclectic selection of special features, second screen bonuses, and amazing artwork. This one is well deserving of our highest possible score! This game has a rating of 5 / 5 with 864 total reviews by the users.